The granting of Russian citizenship to prominent French actor Gérard Depardieu has fueled debates about how fiscal laws work in France, Russia and elsewhere. Drawing by Sergei Yolkin. Click to enlarge the image. The granting of Russian citizenship to prominent French actor Gérard Depardieu has spawned a slew of tax-related comments that are not entirely correct. The story, which is far from finished, must be told in layman’s terms that highlight some basic facts about how fiscal laws work in France, Russia and elsewhere. Until recently, Depardieu was a citizen of the French Republic, as well as its tax resident, an owner of expensive real estate in Paris, and a recipient of various types of income from both inside and outside France. He claims to have paid some €150 million ($199 million) in French taxes without using its social security system once. Headed by François Hollande who came to power in France in 2012, social populists decided that, in the case of Depardieu and folks like him (a total of 1,500 people in France), such a contribution (a mere €150 million for the tantalizing opportunity to receive unemployment insurance and a pension) was not burdensome enough. So, among other tax novelties, they introduced a temporary 75 percent tax on any individual income in excess of €1 million ($1.3 million) a year. Bernard Arnault, chairman and CEO of LVMH, was the first to respond to this step by quietly moving to Belgium and applying for Belgian citizenship. Depardieu followed him across the border and put his Parisian mansion up for sale. He also renounced his French citizenship and acquired a Russian passport instead. Does this mean that Depardieu will now pay Russian taxes instead of French? Not really. To be liable for Russia’s 13 percent personal income tax, in addition to a Russian passport, he will have to be physically present in the Russian Federation for at least 183 days a year. 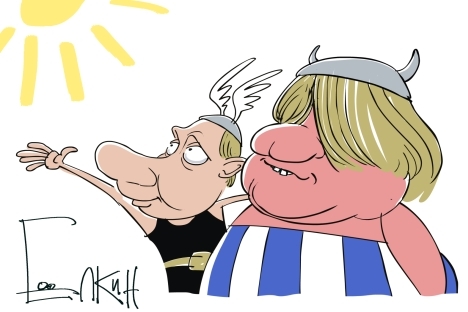 Otherwise, income from Russian sources will be taxed at 30 percent, while non-Russian income (such as the kind Depardieu receives) will not be taxable at all. Depardieu has not yet expressed any intention to live in Russia. If anything, he has been consistently and diligently working toward securing a tax residency in Belgium, while eliminating any grounds for being treated as a tax resident of France. It is for this purpose that he has bought a house in Belgium, put up his Paris home up for sale, renounced his French citizenship, and acquired Russian citizenship – although it could just as well have been Belgian citizenship. As a result, effective 2013, France will only be able to tax Depardieu’s income that comes from France. Income from offshore sources and other jurisdictions as well as royalties and license payments, will now bypass Hollande’s socialist government and be taxed in Belgium or in other countries that are a source of income. The moral of the Depardieu story is that international competition between tax regimes – where it is real within regional market boundaries – remains the only restraint for modern “democratic” states in which voting rights have nothing to do with citizens’ status as taxpayers. While much less visible, similar processes are under way in places like California: following yet another tax hike in the state, affluent residents are quietly migrating to places like Nevada or Florida. Thus, Russia not only has to maintain the evident advantage of its 13 percent flat personal income tax rate, but it also has to keep a keen eye on its real competitors in the tax system contest. Whereas France is competing for taxpayers with Belgium, the UK and Germany, Russia’s neighbor to the east, Kazakhstan, is its actual rival (in terms of corporate rather than personal taxes). Kazakhstan comfortably occupies 17th place in the World Bank’s Paying Taxes rating, where Russia remains ranked 64th, even after rising 40 positions. In this competition, Russia’s 13 percent flat personal income tax rate is far less important than such things as its extremely high level of quasi-tax social insurance contributions. Kirill Nikitin is a tax expert, a partner at PwC and a columnist for Izvestia. First published in Russian in the Izvestia newspaper.